Norton is by no means a really small publisher. But they do have a unique history and continue to publish books that have a real independent streak. When buying with Norton I take a few more chances on books because I trust our sales rep.(Take a bow, Johanna) and I know they publish solid stuff across the board. It's rare to find a publisher that does history, poetry, academic stuff, cookbooks and fiction equally well. Among my stack of books being read/to be read there is almost always at least one of their titles. Just yesterday I got an advance copy of Brady Udall's "The Lonely Polygamist" which will release May, 2010. I loved his last novel, "The Miracle Life of Edgar Mint" and am looking forward to more of his bizarre and epic storytelling. 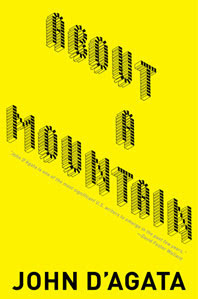 Last week I finished John D'Agata's "About a Mountain" which is a book I want to succeed dearly. It's one of those that is difficult to give a nutshell description of. Customer could say: "So, it's a ecology story about a mountain and disposing of nuclear energy waste? "Well, yes it is. But it's also about how specific locations impact us in both a collective and individual way. It's about a young man who, in helping his mother move to a new city, becomes wrapped up in the city of Las Vegas. And not the Vegas of what happens there stays there. D'Agata goes deeper and does better than that. Alongside all of this is the story of his possible involvement in a young man's death. I don't want to spoil anything so I'll leave it at that. Except to say that, by involvement, I do not mean he committed a crime. Slander and libel suits are expensive, I've been told. It would be remiss of me not to mention that he has edited two anthologies of essays for Graywolf Press. Both are absolute keepers. Later this week a Norton-published first-time novelist named Maaza Mengiste will read from her book "Beneath the Lion's Gaze" at Magers and Quinn in Minneapolis. Details are here. It's a great novel of Ethiopia starting in the mid-1970's and she brings her characters and Addis Ababa fully to life. Labels like "global" and "world" fiction bother me. Fiction is fiction. But the reality is that there are lots of novels being published right now by authors whose names don't roll off the tongues of most Midwesterners. How to choose? Where to start? Anything published by Norton isn't a bad place. And whether it's Brady Udall or Maaza Mengiste you can be sure it is quality work. I just read D'Agata's suicide excerpt in Believer. Damn good stuff. Same goes for your Norton rep. Thanks for the mention. I'm only sorry that I'll be away this weekend, and won't get to hear Maaza when she's here. If you're fortunate enough to be in town, don't miss out. I look forward to seeing what other books you shine a light on. I'm hoping you might mention John Williams' STONER, but my sources lead me to believe that if you choose a NYRB book, it will be the 'new' Don Carpenter. Loved D'Agata's HALLS OF FAME, so I'll be sure to check out his new one.